Indentification of this design as number 110 is original to Rakusan who designated this woodblock print as the 110th design published in his main sequence. However, 110 is actually the tenth of thirty-six woodblock prints in Rakusan's second main sequence series, 篁子生画選, Koushisei Gasen, lit. 'Koushisei's Print Selection' (usually called here the 36 Series). The woodblock print of 110 was adapted from an actual-size original painting on silk. All of the original prototype paintings for this series are currently in a single private collection. Like most 36 Series designs 110 has the same signature and seal combination on every copy. Therefore, for 110 only a single extended edition I (which includes potential reprintings both before and after World War II) can be distinguished. It is usually only possible to date an individual loose print of 110 with edition I markings by listing approximate potential ranges of 1934-1941 and 1948-1955. The copy illustrated above is typical of edition I. The Rakusan project which produced 篁子生画選, Koushisei Gasen, resulted in two related series of woodblock prints. Each print of the 36 Series is intimately connected to a group of prints with the same subjects in the Fan Series. Together these subject-related prints in the two series constitute a theme. Each theme typically consists of a quintet of Fan Series monochrome designs (one design in each of the five fan shapes), plus one 36 Series polychrome design which illustrates the theme subject. The theme is labeled here by the original Rakusan number of its 36 Series design followed by the subject. 110 is the 36 Series design of the 110 Persimmon theme. The 110 Persimmon theme is one of the many entirely regular themes represented by a complete fan quintet and a color woodblock print. However, its compostion is the most complex of any Rakusan theme. The 110 Persimmon theme is unique in having designs with four different seals, as well as also including the widest range of styles. The earliest carving period up through the third quarter of 1933 is represented by Fan Series designs 110-1 (with seal Q) and 110-3 (with seal A). These designs would have been carved at the same time as the mostly seal A designs in themes 101-106, and then set aside. As a result, 110-3 is the last known occrrence of seal A on a first publication of a woodblock print design. In addition to the early seals, there are several stylistic features which also set these two Fan Series designs apart from the others in their theme. These include double-outlining many of the elements, as well as (especially on 110-1) an inconsistent ishizuri rendering of light and dark areas of the designs. The second carving period between the last months of 1933 and the end of the first quarter of 1934 is represented only by the single Fan Series design 110-4 (with seal C). The remaining three designs infilling the theme, the 36 Series design 110 and the Fan Series designs 110-2 and 110-5, have seal B which only began to be used a couple of months prior to the publication of this theme. Rakusan arranged the themes so that all the vegetable and fruit themes 109-112 would be in consecutive order; and the three fruit themes (including 110) would be together in installment four. Unusually, Rakusan elected to infill each of these three fruit themes with a single design co-opted from a very old and well known outside source, Ten Bamboo Studio Painting Manual (TBS). In the 110 Persimmon theme that design is 110-5 which has taken the bird part of its design from TBS. Rakusan adapted the much older TBS design for use in this theme by replacing the original botanical with a persimmon branch as an overlay. Unfortunately, the bird in the TBS source design was very crudely styled; and because it was exactly copied, it looks very much out of place in the Rakusan series. The Fan Series publication materials for installment four indicate that the designs in the 110 Persimmon theme were printed in June 1934 and were distributed June 25, 1934 in installment four (of twelve). The 36 Series design 110 would have been published at the same time. On the delivery documents Rakusan used the theme subject title 柿, kaki, 'persimmon', which was the original title for 36 Series design 110. As in 110 the persimmons in this theme are usually shown at a mature size, but at least one of the designs, 110-2, shows immature fruit. In addition to persimmons, animal life is included as subsidiary elements in each of the designs. 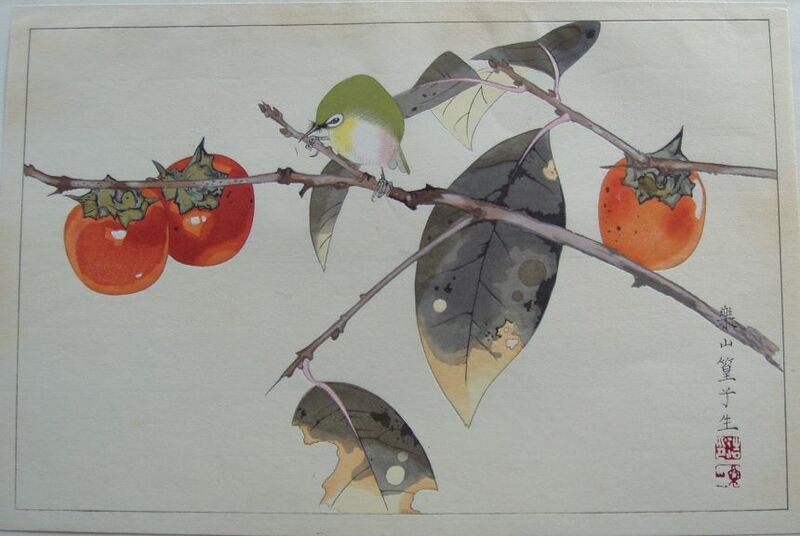 The pairing of the persimmon and the white-eye is a traditional one in Japanese art. Rakusan used the combination in an early design in this theme, 110-1, as well as in the later 36 Series design 110. At least some of the persimmon designs were likely adapted from sketches originally created in the late 1920s during the planning of designs 19 of the earlier 100 Series (see below). Similarly, some of the white-eye designs probably are related to those prepared for design 67.